Wolfbite NITRO™, a premium solution specifically engineered to bond Nylon and Nylon Alloy/Polymer blend parts straight to glass 3D printer build plates without lifting–also known in the industry as ”warpage”–and to enable smooth release of objects after printing. Wolfbite NITRO™ works with any 3D printer equipped with a heated bed that utilizes glass or ceramic printing surfaces. Nylon is an ideal material for 3D printing high-strength, functional parts because of its superior tensional and flexural strength characteristics, as well as its resistance to heat and shrinkage. Nylon and Nylon-based materials are also desirable 3D printing materials because of their machinability and low friction properties. Traditionally, however, these materials did not bond to glass 3D printer build plates. The most common methods for encouraging adhesion to the build plate is combining PET film and generous coats of washable glue; a process that can be inconvenient, messy, and costly. The most significant limitation of this method is that one can only print small Nylon parts due to the de-bonding and warpage during the print process. Airwolf 3D’s new proprietary 3D Printing Nylon Adhesive Wolfbite NITRO™, with its advanced surface chemistry, solves these common Nylon-printing problems. When the build plate cools down, Wolfbite NITRO™ relaxes its bond with the 3D printed object, allowing for easy removal of the part. Wolfbite NITRO™ 3D Printing Nylon Adhesive is the latest addition to the Wolfbite family of products that include Wolfbite MEGA for 3D printing Polycarbonate, Wolfbite for ABS, PETG, TPU, AND TPE, and Wolfbite Nano for use with PLA. This new, environmentally friendly solution resolves the acute problem of Nylon-based 3D printing, part adhesion, and warpage. The solution combines the latest results in the area of polyelectrolyte chemistry, advanced polymer science and nanotechnology creating the best possible 3D Printing Nylon Adhesive solution. In terms of the bonding strength, this is the strongest Wolfbite solution developed and is the only solution in the world which allows direct printing of large Nylon parts directly to glass. 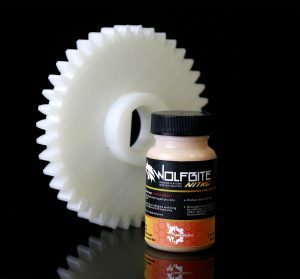 While it is designed to improve the usability and size of Nylon prints for any 3D printer capable of extruding at high temperature, Wolfbite NITRO™ 3D Printing Nylon Adhesive is especially effective when used with the next generation AXIOM series of 3D Printers. The AXIOM’s full enclosure provides a stable printing environment that protects the 3D print from fluctuations in temperature that can ruin large prints. When combined with the AXIOM’s fully enclosed print chamber, Wolfbite NITRO™ enables users to print large parts in Nylon that were previously only possible in some of the most expensive industrial 3D printers on the market. 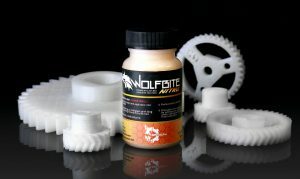 Wolfbite NITRO™ 3D Printing Nylon Adhesive is packaged in a two fluid ounce container and comes with a foam brush applicator. It is currently available for sale on the Airwolf 3D website at an introductory price of $19.95. 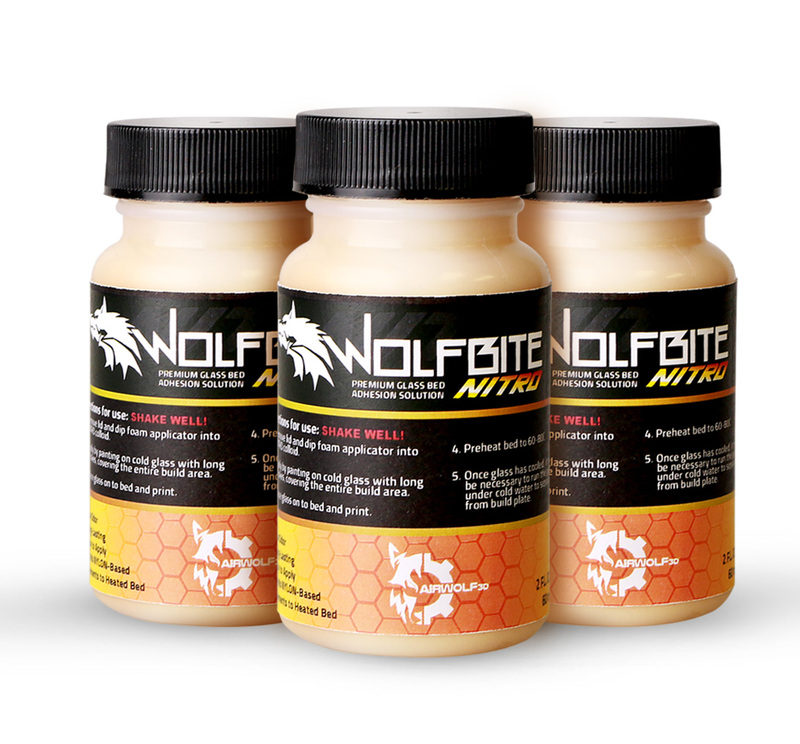 Airwolf 3D will also be demonstrating Wolfbite NITRO™ at the Pacific Design & Manufacturing, ATX West, Electronics West, WestPack, PLASTEC West, MD&M West, and Quality Expo in Anaheim, Calif.
Wolfbite 3D Printing Bed Adhesives. Airwolf 3D is committed to designing, manufacturing and selling 3D printers and 3D printing peripherals that are fast, affordable, durable and easy to use. Airwolf 3D has authorized dealers in more than 20 countries around the world. Airwolf 3D printers are delivered fully assembled and ready to print. All Airwolf 3D printers are made in America and manufactured in the company’s 12,000 sq. ft. facility in Costa Mesa, California. Airwolf 3D printers can be found in Fortune 500 companies, engineering firms, government agencies, and schools worldwide. If you would like to buy the best 3D printer in its class, visit www.airwolf3d.com or you can telephone (949) 478-2933, email info@airwolf3d.com, or visit the company’s showroom at 130 McCormick, Suite 105, Costa Mesa, CA 92626 for a free demonstration. 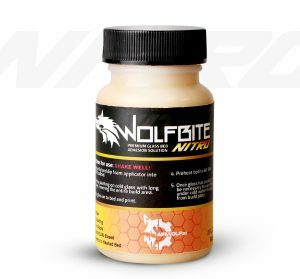 This entry was posted in Blog, Press Releases and tagged Wolfbite NITRO.